The first chapter addresses the phenomenon and concept of a network organization. It is a form that is more and more present in today's digital world. It does not solely concern typical network, virtual organizations that are established and operate only on the internet. We ever more frequently see organizations that go beyond their own traditional organizational structures. They are often interdisciplinary and cover a wide range of seemingly different areas of life and economy. Network organizations are particularly common where knowledge and innovation are created; therefore, they are extremely popular when research and development (R&D) and scientific projects are implemented. 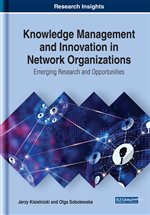 How widespread network structures are in the life of today's organizations will be established by means of the survey results that will be described in this chapter and in the further part of this monograph. The origins of the term “organization” can be found in Greek, where the word organon (Lat. organum) signified a specialized part separated from the environment in order to perform a strictly defined function. This meaning can be easily found in contemporary definitions of the organization, where the main emphasis is on a clear structure and a common goal of action. This is evident in the approach proposed by T. Kotarbiński (1958,75), who writes that an organization is “a kind of entirety, given the relation of its own elements to it, namely the entirety whose all components contribute to its success.” A similar wording is present in G. Hostelet’s approach, where the entirety has been formed from cooperating parts. This collaboration is intentional, as can be seen in the definition put forward by R.W. Griffin, where an organization is “a group of people working together in structured and coordinated fashion to achieve a set of goals.” (1996, 35). R. Ackoff specifies the concept of collaboration and points out that achieving the set goals requires division of labor, introduction of an information exchange system and a command and control system (Bielski, 2004, 35). Interestingly, these classical definitions treat organizations in a goal-based manner. The separation of a specific system, namely an organization, from the environment serves the achievement of common goals. In theory, organizations go beyond the ownership and formal structure. They take the form of networks of links and relationships present in the market (Figure 1). The digital revolution has covered management to a large extent (Brynjolfsson, McAfee, 2015). This influence is evident both in the take-over of certain areas of organization management by IT systems (e.g. production automation) and through changes in organizations themselves and their organizational structures. Classical organizations, structured in a hierarchical fashion, follow a unique path of evolution. What could be observed in the 1960s was the transformation of classical linear organizational relationships into matrix structures intended to streamline management and facilitate project management (Stoner & Wankel, 1996, 218-219). Nowadays, typical network organizations are ever more often emerging. The rise of such organizations is largely dependent on the development of networks and information and communication technologies (ICTs). The network-based nature of an organization does not only mean how the structure is organized formally but, to a much greater degree, how it operates. The importance of ICT infrastructure for the formation and operation of network organizations is described in a further section of this manuscript (Chapter 3). Network organizations are oftentimes established to make knowledge exchange better and to improve the efficiency of knowledge management. They emerge as a result of the transformation of traditional structures organized in a hierarchical way into modern forms relying on the use of ICTs. These are structures that are not affected by functional and geographical constraints as much as classical organizations. Their driving force is an IT network allowing them to cross both geographic and institutional boundaries without much impediment. M. Castells even speaks of a new type of economy (information economy) that is replacing the old-fashioned industrial approach (2007, 189). In the previous type of economy, the competitive advantage was generated by economies of scale, while today’s new economy relies on the economics of networks which involves expanding the reach of the network, whereby the network can significantly increase its value by connecting to other networks (2007, 191). The establishment and operation of network organizations under the new management approach is driven by the desire to find modern and non-standard solutions, the development of knowledge and the support for innovation.